There’s no denying that Banashankari’s cafe scene isn’t all that big. But that doesn’t mean it’s bad. In fact, on our recent visit to this South Bangalore suburb, we spotted quite a few cafes that tick off all the attributes of a good cafe — ambience, pocket-friendly, and good grub. Here’s our pick of the cafes in Banashankari that we wouldn’t mind being a regular at. It’s the rooftop, semi open-air ambience paired with cutesy, Pinterest-worthy decor that we so love. Decor goals come in the form of dreamcatchers, painted scooters, planters, and fairy lights. Plenty of spots for selfies with the BFF or squad, we say. Pizza, pasta, sandwiches, steak, and a whole lot of starters such as Broccoli Cheese Nuggets, Loaded Cheese Fries, and Chicken Pops, should keep the hunger pangs away while you are chilling out with your peeps. Coffee, milkshakes, and mocktails complete rest of the menu. It has the makings of a bar, with high, colourful metal stools, and long community tables, but mocktails and coffee are your only choice of drinks. Wood-fire pizzas are what they specialise in and best part is you can make your own pizza. Choose your base, toppings, size, and chat away while you wait the pizza to be baked. Half-and-half is available too. Burgers, sandwiches, pasta, and starters such as Veg Crostini and Chicken Wings with Pickled Cucumber are also on offer. If stuffing your face with churros is your idea of fun, then this is the place to be. They do an all-you-can-eat unlimited offer from time to time, which gets you unlimited pizza, churros and fries. Otherwise, the menu has the usual mix of Mexican and Italian fare such as Loaded Nachos to Bruschetta, along with thin-crust pizzas, pasta, and a few Thai curries. You might want to give the coffee a skip and settle for hot chocolate simply because the Madrid Mocha gets you the best of both worlds. It’s thick hot chocolate with espresso. Talk about sugar and caffeine rush in one go. Call dibs on the swing chairs if you are going with your date. That’s easily the cafe’s best spot. The rest of the cafe is filled with either stools or sit-down chairs. There’s also a plush couch for you to squat with your peeps for hours long. Their drinks menu is extensive for our liking, but Hot Cocoa and Chocolate Shooters does sound nice. Sandwiches and burgers or even pasta should fill you up nicely. They also have an all-day breakfast menu of waffles, crepes, and pancakes that should sit nicely with anyone with a sweet tooth. Sheesha, live matching screenings, and a rooftop — the three things that make this place a winner. Game nights tend to be crowded with patrons cheering their team on while munching on anything from momos to chicken lollipop. They also have a Maggi section with the Chicken Tandoori Maggi sounding all kinds of wrong but all kinds of right! 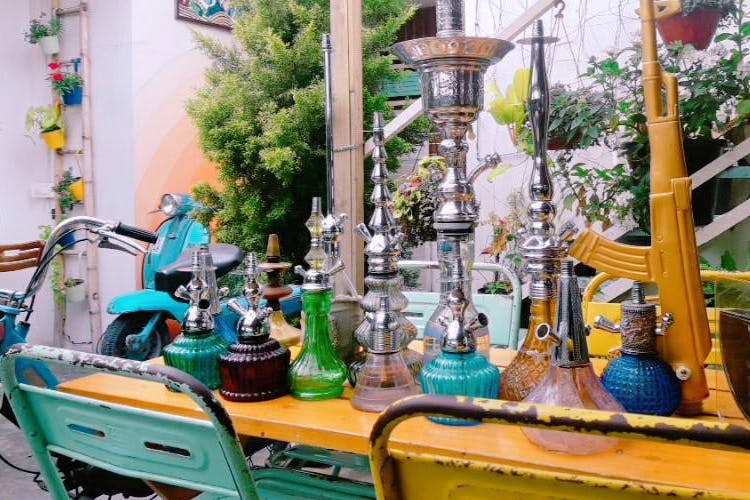 Head here for sheesha in various flavours including the usual fruity flavours such as blueberry and watermelon to weirdly name ones such as Night Queen and Silver Fox.